The final Sherlock Holmes novel, The Valley of Fear (VALL), is written in two parts. Part One is an English murder mystery. Part Two is a flashback which took place in the USA regarding the earlier life of one of the major characters of Part One. In the final scenes of Part One, it all came together as Holmes solved the mystery and identified the killer. As related by Watson, The proceedings seemed to have come to a definite end so far as he was concerned; for one had only to look at that granite face to realize that no peine forte et dure would ever force him to plead against his will. The deadlock was broken, however, as the truth emerged from an unexpected quarter, Holmes explained everything, and the story moved to its conclusion. But what did Watson mean by “peine forte et dure”? The meaning is almost obvious from the context. The words themselves are French meaning “strong and forceful punishment”, or essentially, torture. But the term has a historical meaning that goes far beyond mere words, extending forward from medieval times, involving kings and popes and blond bombshells, influencing the drafting of the US Constitution, and even representing a dilemma facing one of Holmes’ clients in a later story. In medieval times, criminal justice was not exactly what it is today (an understatement). A person accused of felony was often judged by authorities who used God’s help in determining guilt, but using means devised by the authorities themselves. One common method was binding the accused’s hands to a very hot rock or tool, causing severe burns. Then later, if the burns healed cleanly, it was accepted as proof of God’s approval of the accused. If, however, the burns festered (became infected), it was viewed as proof of guilt, resulting in hanging. A similar proceeding was to bind the accused and then lower him into water. If he floated, it was a demonstration of guilt. If he sank (was accepted by the waters with God’s blessing), he would be pulled out before drowning, and considered to be not guilty. This general system was disrupted in 1215 after the Fourth Lateran Council under the direction of Pope Innocent III, one of the most influential popes of history. The pope banned the practice of the clergy’s participation in the judicial ordeal, effectively prohibiting it, and leaving civil authorities to devise new means of determining guilt. This they were able to do. Judges of the time felt a need for some assistance, and because of Innocent III, the wisdom of Divine Providence was no longer available to them. Methods had to be devised that would do the job. Judges often considered themselves to lack jurisdiction over a defendant unless he had voluntarily submitted to it by entering a plea seeking judgment from the court. A justice system that punished only those who volunteered for it was not very practical; there had to be a way to coerce them. The general idea was that an accusation was indicative of guilt. However, the methods used to verify the guilt were not yokes which defendants would find easy to bear. The accused would be given three chances to plead (confess) and death by hanging would be the result of a guilty plea. If the accused did not plead guilty he would be encouraged to do so, by a form of strong and forceful punishment, or peine forte et dure. The procedure that evolved during the reign of Henry IV in the 13th century, generally took the form of the accused being pressed under heavy weights until confession or death ended the ordeal, but an important distinction evolved in the law. If the defendant did not plea, and then died, his family could inherit. However, if he confessed, his property would escheat to the crown (government). This provided incentive for the accused to tolerate the torture until relieved by death, for the benefit of the family. The idea that the guilty party’s property could not be passed on became known as “corruption of blood”. The “death by pressing” procedure was gruesome. The subject was tied spread-eagle, and had a fist-sized rock placed under the spine. Then a flat board or platform was placed on his (or her) chest and weights piled onto it, a bit at a time. A skilled operator could make the procedure last for days. Commonly, the subject was given bread and water; a little water one day, and some bread the next. After a considerable period of time, the subject’s rib cage would collapse under the ever-increasing weights, and death would result. This method of resolving felony questions lasted for several centuries, beginning in the 1200’s after Innocent III took God’s judgment out of the process, and ending, in England, in 1772 when the procedure was prohibited. 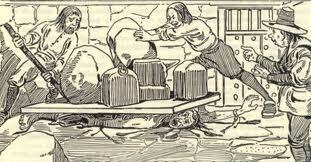 The last known actual use of the process of Peine Forte et Dure in England was in 1741. In the North American colonies, the practice was part of the legal system but rarely used. In a case during the witchcraft trials in September of 1692, Giles Corey, an elderly farmer in Salem, Massachusetts, was executed by pressing. It is the only well-documented case of peine forte et dure in the territory that became the USA. Corey’s wife was a Roman Catholic, and was known to read books. This got her trapped in the witchcraft hysteria of the time, and when her husband came to her defense, he was prosecuted as well. Corey stood mute, to preserve his property for his heirs, and was subjected to Peine Fort et Dure. He took it boldly, and his last words were reported to be “Put on more weight”. In the Orient, India and Southeast Asia, elephants were used to crush people who did not enjoy the pleasure of various rulers. 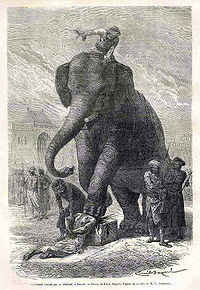 The elephants could kill slowly or quickly under the control of their skilled Hindoo or Mohammedan handlers, as called for. These procedures were common and used for centuries, but then were ended around 1900. European colonists were shocked by the grim procedures they saw. The Oriental process of execution by crushing with elephants was more refined and controlled than piling up weights, and used elephants specially trained for the purpose, compared to the crude and less predictable European methods. As a result, it was even more dreadful. But what about he U.S. Constitution? Article III Section 3 states: “The Congress shall have power to declare the Punishment of Treason, but no Attainder of Treason shall work Corruption of Blood or Forfeiture except during the Life of the Person attained.” The corruption of blood issue was discussed in the Federalist Paper number 84, written by Alexander Hamilton. And Blond Bombshells? One of the most famous of all, Marilyn Monroe. In 1956, at the height of her popularity, she married the well-known American playwright, Arthur Miller. (Five years later, they were divorced.) One of Miller’s best known and most highly acclaimed works was The Crucible, which allegorically described Miller’s experience with the House Un-American Activities Committee (HUAC), by comparing it to the Salem witch-trial experience of Giles Corey. Of course Miller was not actually subjected to Peine Fort et Dure as was Corey. And finally, one of Holmes’ clients. In The Adventure of the Engineer’s Thumb (ENGR), the hydraulic engineer, Victor Hatherley, was hired by some counterfeiters to tell them how to repair their hydraulic press. After he completed his work, they tried to kill him by trapping him in the press. He had to ponder the tough decision, while the die slowly descended, of whether to lie on his back or his chest at the end. Luckily for Mr. Hatherley, it did not go that far. He miraculously escaped, avoiding his own peine forte et dure, but he lost his thumb in the process, and went to see Dr. Watson to have the wound bandaged.